I’ve mentioned this Photo Set Finishing Powder before, I’m sure, but it deserves a full post because it’s an essential part of my makeup kit when I’m filming. It’s a very fine, ultra-lightweight face powder that takes away shine and leaves the very faintest “blur” on the surface of my skin. Rather than absorbing oil and then sticking to whatever foundation I have on, it seems to almost sit away from the skin like a light veil – it’s quite hard to explain, really, and it’s not something that a video would demonstrate very effectively! 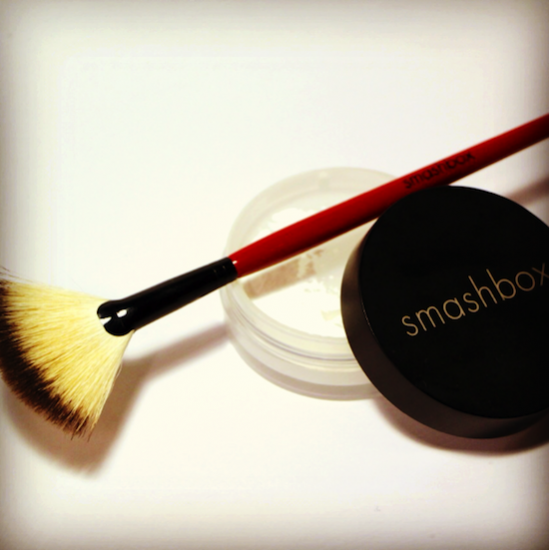 I apply the Photo Set Finishing Powder using a fan brush – the one shown is by Smashbox but there are plenty out there that are light and feathery. I dip the brush into the powder pot and make sure that I really get rid of any excess powder before gently sweeping the brush across any skin that looks shiny. It has this amazing revitalising effect on makeup that seems to make everything look a little fresher and less tired, and I suppose this is why it’s such a permanent fixture in my filming kit. I love pressed powders too, and I’m really fond of my big tubs of Chanel and Shu Uemura loose powders, but the Smashbox one is so light and portable, so colourless and easy, it just ticks all of the boxes. Previous Post TWO Magazine Photoshoot – Yeee-ha!